The most expensive thing you will ever buy is a house. It deserves more research than just checking that you can manage the payments. 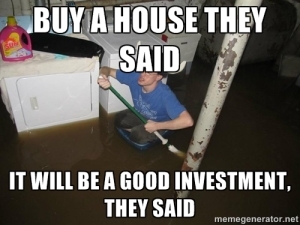 Sure, there are a number of non-financial reasons to own a house. 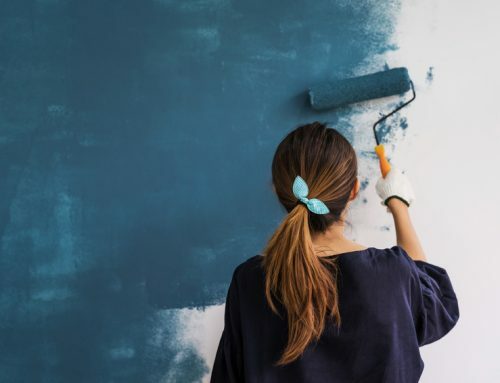 You don’t have to deal with a landlord (just the HOA), you can knock down some walls (if they aren’t load bearing, and the city/HOA let you), you are a “homeowner”. These things might matter a great deal to you. They might matter more than the financials. 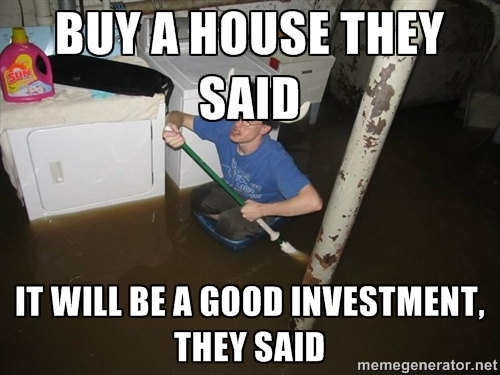 There are also non-financial reasons to rent. You get more flexibility about where you’ll live from year to year. The financial calculation, however, is complicated but well defined. There are dozens of variables involved. Unfortunately for you, this calculation is non-optional. 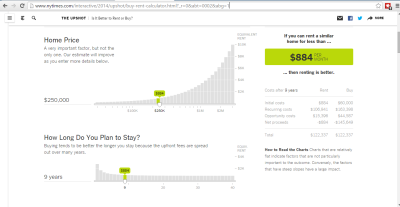 Fortunately for you, the New York Times has taken all of the relevant variables and made a nifty calculator. You officially have no excuse! The only housing valuation calculator you may ever need. You can access the calculator at here. What you’re looking to compare is the final rent price on the right to the rent of an equivalent place after inputting all of your relevant data (I promise one exists, look). As you move through the calculator you’ll see that the slope of the variable is related to how much a variable effects the final rental value. You’ll notice that there are a couple variables that are somewhat hard to get a good value on. For example, how long you plan to stay is sometimes tough one. The entire “What does the future hold?” section is a complete crap-shoot. Worse, some of the values in this section effect the outcome a great deal. My advice is that if you are assuming that you are staying in the house for a long time, you should assume that the money will be invested for the long term in the stock market or a similar high-volatility, high-return vehicle. Over decades the stock market returns about 8%, so that should be your investment return rate. 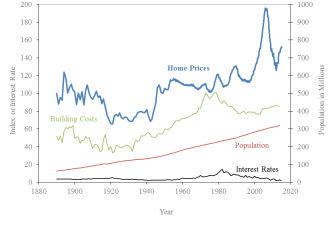 Similarly you should use the long run return of housing in the US which is just a little above inflation (something like 0.2% above inflation) according to Robert Shiller. If you look at the plot on the right, you may be tempted to think that home prices really only started appreciating after World War 2 and that things are different now. That may be fair (this earns you about 1% above inflation, go nuts). Also, look at the amount of volatility we’ve had since then as well. Keep in mind that every time the blue line goes down by a percentage equal to your down payment, you’ve just gotten underwater on your home. A 20% downpayment seems pretty historically safe (except for the most recent recession fun). A 10% downpayment gets wiped out every decade or two. Don’t give in to the temptation to adjust the knobs on this calculator until you get the answer you want. This is the second most important financial decision you’ll make in your life (Reminder: Fund your Roth). Don’t lie to yourself about it. Also, do NOT simply say, “House prices in my area have historically gone up faster, so I can use a larger appreciation number.” This is approximately as bad as saying, “Historically Microsoft has gone up faster than the rest of the market, so I should buy it and assume I can use its past average growth rate.” So you’ve filled it out? Great! 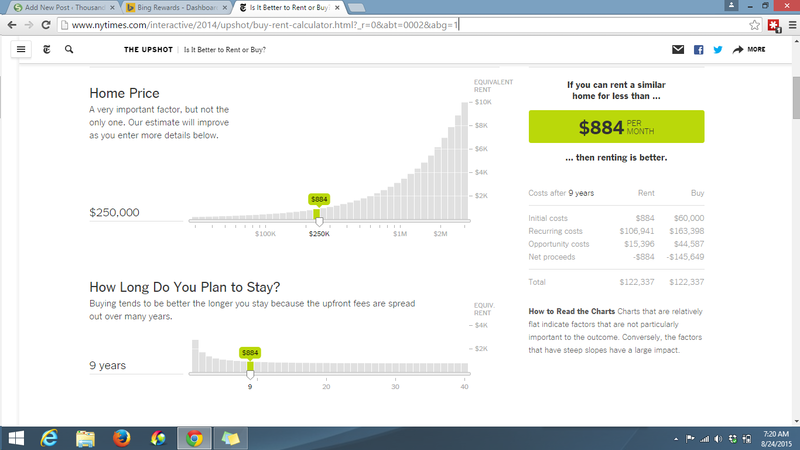 Which is higher, the rent you can get, or the breakeven rent from the calculator? The real value of this calculator shines through when you work backwards from a known rent. For example, let’s say that I’m trying to decide between buying a condo that rents for $1,800 and is selling for $225,000. I use default values for everything, and change investment return rate to 8%. I also add in monthly common fees (HOA fees) of $400. The last thing I change is the home price growth rate, and I adjust it until the big green number on the right is $1,800. This solves for the growth rate that breaks even. In my case that growth rate is -0.8%. If housing values fell 0.79% per year over nine years (the time I owned the home) I would still come out ahead by buying. By running these sorts of scenarios you can see what works and what doesn’t. Looking at another example, a single family home near my area is selling for $365,000. A very similar home is up for rent at $1,600 per month. HOA fees are much lower in this area, so I adjust for that. The value of this home has to increase by 3.2% per year in order to justify the purchase, this may or may not be reasonable. I’ve done this too many times. I say it one last time. A house is your largest purchase, interest rates are very low and it may therefore seem like buying a house is the right idea, but do the math!